Are you having a ball this summer? We are… literally! You won’t believe all of the wow-worthy derivations of the ever-popular ball that we have rounded-up. 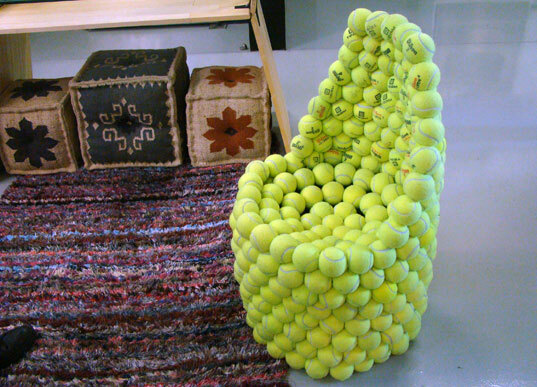 Designer Hugh Hayden made a cheery, yellow chair out of tennis balls! His “FUNature” will certainly put a bounce in anyone’s step. Designer Toby Sanders shines a light on the symbol of summer, the beach ball, and suspends it in mid-air with his playful and delightful beach ball lamps. What’s the ultimate on-the-go, unplugged hand-held device? Playable art balls, which place endless creative fun in the palm of a child’s hand. This impressive solar-powered soccer ball could help the blind play soccer via motion-sensing technology. Feeling resourceful? Make your own eco-friendly soccer ball using crumpled up newspaper and tape! We really get a kick out of this energy generating soccer ball, that brings power to developing nations by ingeniously capturing and storing energy generated by play. And get a load of this awesome SWIRL ball that is a combination of a washing machine, a barrel and a toy. Headed outdoors to the pool or water table? Here’s how to make a sponge ball water toy to soak up fun in the sun and stay cool! Are you having a ball this summer? We are... literally! You won't believe all of the wow-worthy derivations of the ever-popular ball that we have rounded-up. Designer Hugh Hayden made a cheery, yellow chair out of tennis balls! His "FUNature" will certainly put a bounce in anyone's step. Designer Toby Sanders shines a light on the symbol of summer, the beach ball, and suspends it in mid-air with his playful and delightful beach ball lamps. What's the ultimate on-the-go, unplugged hand-held device? Playable art balls, which place endless creative fun in the palm of a child's hand. This impressive solar-powered soccer ball could help the blind play soccer via motion-sensing technology. Feeling resourceful? Make your own eco-friendly soccer ball using crumpled up newspaper and tape! We really get a kick out of this energy generating soccer ball, that brings power to developing nations by ingeniously capturing and storing energy generated by play. And get a load of this awesome SWIRL ball that is a combination of a washing machine, a barrel and a toy. Headed outdoors to the pool or water table? Here's how to make a sponge ball water toy to soak up fun in the sun and stay cool!